Residents Worry: Will Route 5 Plan Destroy Varina? | News and Features | Style Weekly - Richmond, VA local news, arts, and events. 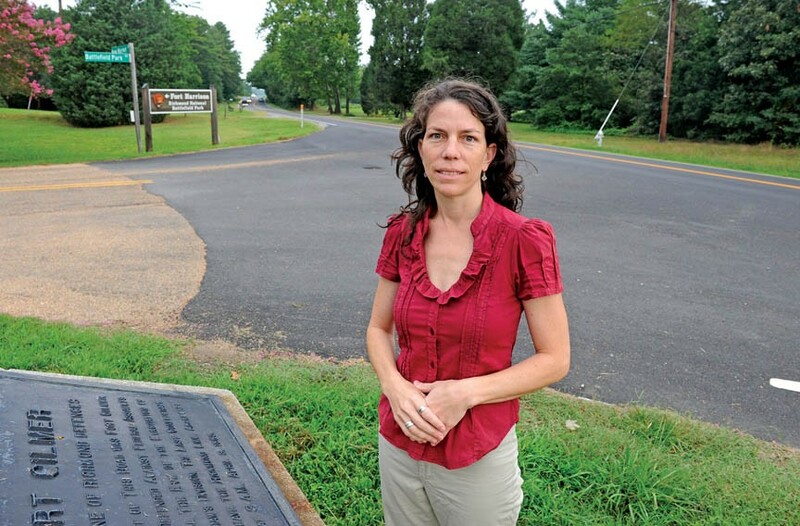 Varina’s at a crossroads, says Nicole Anderson Ellis at New Market and Battlefield Park roads. It's the next great suburban frontier: Thousands of acres, making spots for more than 7,000 new houses, have been rezoned for development in eastern Henrico County along Route 5, from Rocketts Landing east to state Route 895. To accommodate the expected growth, state and local officials are pressing for $70 million in road improvements. But a growing number of residents and neighborhood associations in Varina and the city say the improvements are a mirage, and that the plan to widen sections of Route 5, or possibly Osborne Turnpike, from two to four lanes will destroy the corridor's rural character. A planned 70-foot railroad bridge also would obscure views of the James River from Church Hill. "Varina is at a crossroads," says Nicole Anderson Ellis, a Varina resident spearheading the opposition. "We have to decide which way we're going to turn." In front of a crowd of roughly 50 people in Manchester last week, Ellis offered a substitute to the plan proposed by the Richmond Regional Planning District Commission and the Virginia Department of Transportation. Ellis proposes building houses set back from Route 5, allowing the road to maintain its rural charm. She suggests clustering houses to allow for more green space and agriculture, which saves developers money by centrally locating utilities. Instead of widening roads, Ellis proposes a series of roundabouts like Loudon County uses. Creating conservation easements also could help Varina maintain its character, she says. "I have faith that when presented with the obvious pros and cons of this situation, our elected officials will make the right decision," says Ellis, who serves as a director of the Henricopolis Soil and Water Conservation District. But the road improvements are necessary to support existing and future riverfront development, state and local planning officials say. And transportation consultants contend that portions of Route 5 already struggle with congestion during peak morning and afternoon hours. Congestion on Route 5 is a myth, Ellis counters. Route 895, for example, was built in anticipation of the residential boom and scarcely sees more than 15,000 cars pass through its toll booths daily. Some people have speculated that widening plans are driven by pressure from developers instead of actual need. After the housing collapse in 2008, major residential developments such Wilton on the James and Tree Hill Farm were put on ice. The road improvements, however, could help kick-start the dormant Varina subdivisions. Ellis' alternate proposal has gained the support of at least 17 neighborhood groups and organizations, including the Shockoe Bottom Neighborhood Association, the Church Hill Association and the Coalition for Smarter Growth. The Rev. Tyrone E. Nelson, Varina District supervisor for Henrico, says he appreciates Ellis' efforts but doesn't think the county board should oppose it. "From where I stand, this is a VDOT project," he says. "I don't think the Board of Supervisors is going to intervene. I don't see a point."